Wonder why they don't bring things this cool here? This is the entrance to the France Metro. Leave it up to the other countries to do something cool and integrate pop culture into their cities. Cmon U.S. we can do that here too! BTW if you don't know who Pajitnov is, he is the creator of Tetris (full name Alexey Pajitnov). Because of the Soviet Gov. 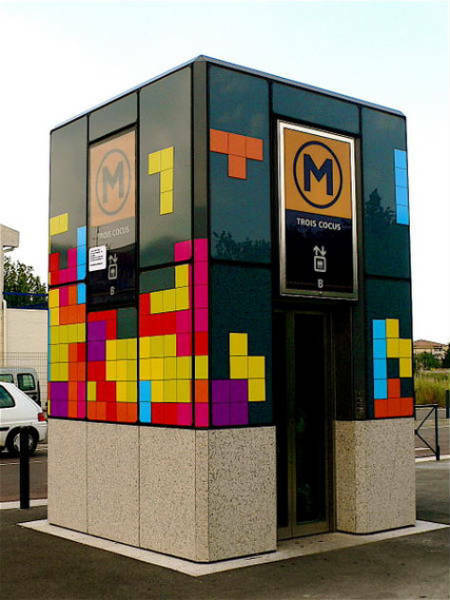 had the rights to Tetris (yes, horrible), he hardly made any money from this meg huge franchise. It is cool to see that some still show appreciation for it and what it did to pop culture. See more metro art HERE.